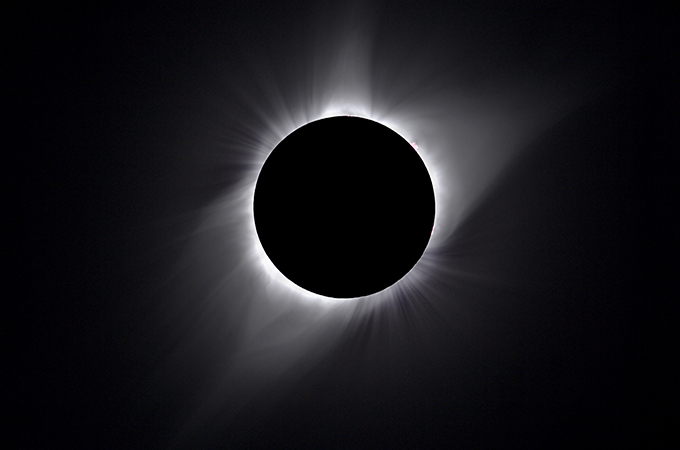 U of R Professor Tyler Nordgren was quoted on the August 21 eclipse in publications from The Atlantic to Newsweek. University of Redlands and its students and faculty experts made news in the months of August and September on a variety of topics—from celestial events to California politics. Throughout much of 2017, University of Redlands professor and physicist Tyler Nordgen was on a mission—encouraging would-be viewers of the August 21 total eclipse to make their way to a location along the 12-state path of totality, put down their phones and cameras, and fully experience the moment. Those who missed an article or haven’t had a chance to read Nordgren’s latest book about the eclipse, Sun, Moon, Earth: The History of Solar Eclipses From Omens of Doom to Einstein and Exoplanets (Basic Books, 2016), may have seen the series of posters he designed in the style of Works Progress Administration posters from the 1930s. This latest work from Nordgren, who is well known for his art and photography, was featured in Newsweek. The story of the eclipse was heard around the world, but another important story made history here on campus. The University’s first female live bulldog mascot, Adelaide a.k.a. Addie, debuted as mascot-in-training. NBC News Channel 4 thought our little pup was big news as well. Addie was featured on the news broadcast and the website. U of R also made headlines in San Diego, opening a new regional campus serving working professionals, active military, and veterans. The Times of San Diego and KUSI News were both at the grand opening event Sept. 25, 2017, when the ribbon was cut, symbolizing the expanding opportunities at the campus. The University also made news by making music; College Magazine named the School of Music one of the “10 Cutting Edge College Music Education Programs.” Professor Catherine Salmon told Fox 5 News about the psychological benefits of being a middle child, and Professor Renee Van Vechten talked to the Orange County Register about California’s biggest political fights, and discussed the possibility of the next democratic presidential candidate hailing from California. The most unusual media of the month? That came from The Science Channel series, “Mysteries of the Missing: Ghost Ship of the Desert,” featuring U of R Professor Tim Krantz. Is there a ghost ship in the desert? The curious will have to watch and find out.